Bill’s instincts were right on the money, and the following year the summer showroom became a permanent part of his business model. To this day, everything we do at THE SIGN is informed by Bill’s commitment to quality and his passion for enjoying the best that life has to offer. We miss him every day, and we are honoured to carry on his legacy. 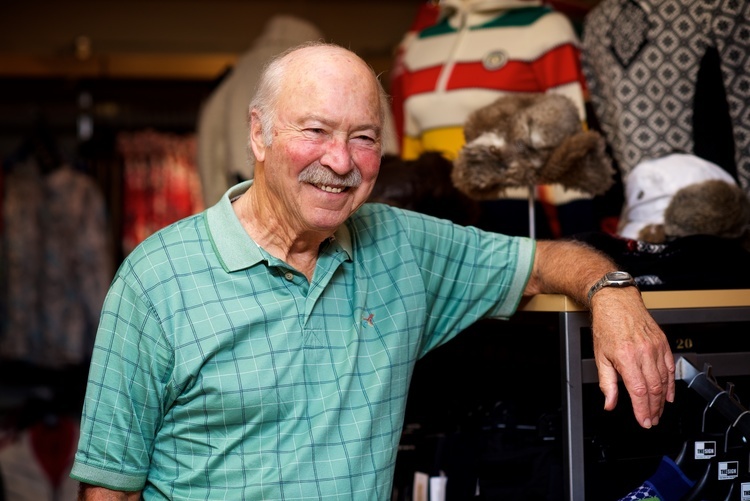 As owner and manager of THE SIGN, Paul (Bill’s son-in-law) is involved in every detail, from skis and boots in the winter to outdoor furniture in the summer. Back in the early 1970s, when The Sign carried one brand – Samsonite chairs with a mesh sling, it was considered top-of-class. Clients still come in to ask if they can get replacement slings. (Our answer: yes!) Paul inherited the furniture portfolio in 1983 and made the decision to take it to a new level. He was meticulous in his research and his hard work paid off. In 2006, THE SIGN won the prestigious Apollo Award for the Best Garden Furniture Store outside of the United States. Bonnie is our clothing specialist, primary clothing buyer, and carries her Dad’s tradition of paying close attention to everything that’s sold at the store. During the winter months, she’ll help you find the perfect clothing and accessories for the slopes. In the summer, her involvement is in the furniture selection process. She goes to the industry shows and personally tests every chair, chaise lounge and umbrella. (Tough job but someone has to do it!) Her eye for fine design comes shining through, winter and summer. As a clothing specialist, assistant buyer, and furniture expert, Anne is a woman of all seasons. She reported for duty in 1985 and has never looked back. Her time at the store brings a wealth of practical knowledge to the buying expeditions that she is part of each year – for winter and summer product. She listens carefully, figures out what your needs are, and will find the most suitable brand of garden furniture for you, your friends and family. AKA the Silver Fox, Norm is a superb equipment specialist and boot fitter, who has worked at THE SIGN for more than 20 years. In the summer, you’ll discover he is equally well versed in the finer points of outdoor furniture and BBQ intel. He is easy going, responsible, an avid golfer and fisherman and a gentle soul who will guide you through the BBQ options – from Weber to the Big Green Egg. And in the same spirit that Norm fits your boots in the winter, he’ll help you select the garden furniture that’s the best fit for your backyard or cottage! Kevin is one of our most multi-faceted employees at THE SIGN. Equally knowledgeable in our hard goods department, service department, and outdoor furniture, you will enjoy his enthusiastic explanations of the pros and cons of each of our different brands. He’s also a gifted photographer and has taken the time to put together an album that celebrates some of our best summer finds.